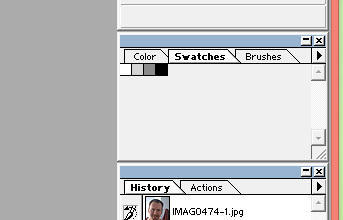 -click the little arrow, save swatches as "4color.aco"
-select the part you want, and crop it. because final result will depend on exactly how you draw those lines. -then touch up the picture, and save it. results with the index color step. All these examples are 32 pixels wide. 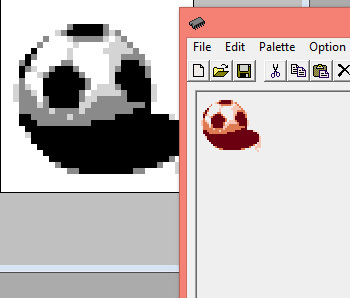 Here's a soccer ball (football), for another example. I've got a different technique for portraits. The only advice I have regarding photos on the NES is... don't do it. 99% of the time it looks like crap. I can think of a few examples from movie-based games where actors have been redrawn that look nice, but that's very rare. 3 or 4 colors are far from being enough to represent real world lighting, so unless you use a lot of tricks to make it look like there are more colors (dithering alone won't cut it), don't expect good results. EDIT: While I do think photos don't go well in actual games, I don't want to discourage experimentation. It's always fun to see how the NES handles things it wasn't supposed to, like photos, 3D, videos, and such. I just think it's important to know what belongs in a game and what doesn't. I looked at some of the examples from thefox, and they look great! How did he get enough unique tiles to fill the entire name table? Bank swapping mid-frame? Here's how this method looks at 128x128, and in an actual NES file. The only thing I touched up was the eyes and the beard. 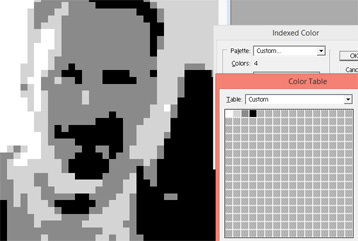 Slight dithering setting on the "indexed color" step. I need to refine the process a little, I'm not 100% happy with the results yet. 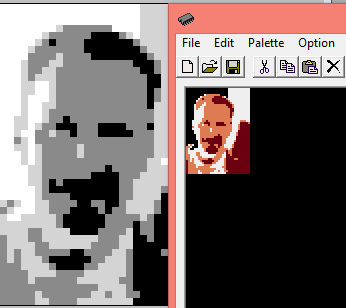 The only satisfactory way I've had for doing this is just to load up the photo in an image editor, put it on a layer underneath and draw the NES image on top of it by hand. It's not an instant process, but it isn't extremely time consuming either. You can do a lot better with your human brain and experiences than any automated process. Making decisions about what lines are important, what things to highlight, where to concentrate detail, where to leave it out, where to smooth over an unimportant detail, etc. this is something that takes understanding of the image, recognition of the things in it, and an aesthetic appreciation of them. 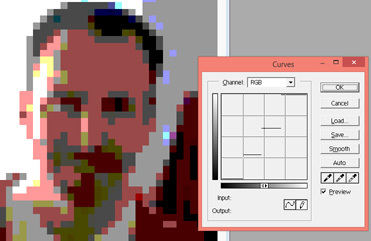 Simple computerized processes are just going to treat the image as a signal, every pixel is equal. More advanced ones might try to find edges or shapes and emphasize them. Really advanced ones might try to identify eyes or other areas that should have a different process of detail applies to them. You just gave me an idea. You could use this kind of automated process (because it's actually fast - minus the coding it took like 5 minutes) and make a series of picture banks, and swap them every 8-10 frames, and you'd have a detailed movie file, in an NES game. you could have about 20-30 frames - that would be about 3-4 seconds of video. Combine that with a DMC sample and you could have audio and video in sync. Uncompressed video isn't really practical to use in a game, as even a very short clip would consume nearly your entire CHR chip (unless you came up with a new mapper that could stream tiles from an SD card or something, but many would consider that cheating). But if you use a little compression, then yeah, I think NES can have little video clips here and there... maybe an opening sequence similar to that of Sonic 3D Blast on the Genesis. I was thinking more like this...10 images on a loop. Done with bank swapping. Could be nice for a title screen. Mario 2 had uncompressed video at the very end (Mario sleeping). By the way. I need to find a forum with less intelligent people. Every time I come up with (what I think is) something clever and interesting I get a "here's an example that's 1000x better and more complicated". Man, you guys never cease to amaze me. Remember, some of us here have been doing this since last century. By the way. I need to find a forum with less intelligent people. There are people here that have been around since the dawn of emulation... most ideas have already been thought of, and out of those, many have been actually executed. I can see how that can be frustrating for newcomers... on the other hand, they have years and years of interesting stuff to catch up with. First thought: posterize it to seven shades. Four shades map directly to solid colors, the other three map to 50% checkerboard dithering between two colors. This will reduce the amount of detail, but has a high chance to look stylized enough to look like it was intentionally drawn like that. After this the amount of cleaning needed should be minimal hopefully (or even get away without doing it). 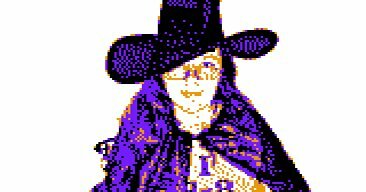 I actually have been visiting this forum for 6-7 years, I joined this year because I finally got around to programming a game.